Critical care wherever it is needed, 24/7/365. We work closely with first responders and hospital staff to transport those in greatest need wherever they need to go to receive definitive care. We can employ equipment on our aircraft that’s typically only available in the best hospitals, including balloon pumps, isolettes, blood and plasma on every flight. We put the lifesaving discoveries of UW Medicine in the air and into action to better safeguard patients’ lives. All people deserve high-quality critical care. If you can help, you must act. This is how we began, with the deeply held conviction that lifesaving care is a human right for everyone, everywhere, young and old. After a tragic house fire in Sitka, Alaska claimed the lives of three children, Dr. Michael Copass, then director of emergency services at Harborview Medical Center and Medic One, founded our region’s first air medical transport service in 1982. That same founding passion fuels Airlift Northwest today. Pushing ourselves to be the ultimate partners in critical care, we bring everything we have, every time. AirCare Membership protects you and members of your household from the unexpected costs of air transport during a medical emergency. When you or a family member are seriously ill or injured, the attending physician or emergency response team may determine that air medical transport is needed. In those cases, you may request Airlift Northwest. We offer memberships for residents of Alaska and Washington as well as vacation memberships. We are able to rapidly deploy our emergency flight crews to provide service in one of the largest and geographically varied areas of the world — from isolated islands in Alaska to coastal villages in Western Washington and desert communities in Eastern Washington. We have seven bases strategically located in Juneau, Alaska, and Arlington, Bellingham, Bremerton, Olympia, Yakima and Seattle in Washington. We have invested in one of the most highly trained and skilled staff in the industry, and they’re continually engaged in outreach efforts to strengthen the communities we serve—including yours. We offer ongoing training for local EMS teams, fire departments, hospitals, clinics and the general public through continuing education courses, landing zone trainings and participation in community events. Calling us engages professionals with the latest technology to help save lives when timing is crucial. We connect you to assets from our network of bases. Our communications center is plugged into the National Weather Service and state communications at the highest levels. We close the loop by following up to update you on your patient’s condition and our ETA. We are a constant partner and resource throughout the transport process. Learn more about our new mobile and desktop app that activates us with the touch of a button: 206-521-1599 or christina.sargent@airliftnw.org. In disasters, we can supplement your team, fly in our highly trained nurses and connect you to our resources. We listen and work together as an extension of your staff. Airlift Northwest is integrated into both state and federal disaster plans. We also frequently participate in disaster recovery drills and training. Every critical care flight transport team consists of two registered nurses: one pediatric and one adult. Qualifications for flight nursing include five years’ experience in critical care or emergency room care of adults or pediatric patients (which includes newborns). Many of our nurses continue to actively work in these environments as well. The cumulative experience on each flight can equal up to 50 years of combined nursing experience. Each flight nurse holds a certificate in their area of expertise; this includes certifications in pediatric critical care, adult critical care and/or neonatal critical care. We invest in higher-level healthcare, outfitting our fleet with the latest rotary and fixed wing aviation technology and aircraft. We go further to ensure your safety, with aircraft and equipment that can transport patients in changing weather conditions. For example, our Pilatus aircraft can safely operate in adverse weather conditions and transport bariatric patients (up to 550 lbs) from rural airstrips. Our commitment to safety leads us to invest in some of the most up-to-date equipment available, including state-of-the-art night vision goggles, satellite tracking and communications, as well as GPS approach systems, so our teams can fly quickly and safely at every hour. Aircraft are equipped with the latest recommended equipment, including terrain-avoidance warning systems and aircraft proximity warnings, in addition to a weather radar. All aviation services, pilots, and mechanics provided by Air Methods Corp. and Aero Air, LLC. Continuous, seamless medical care while in transit, with no time lost, means patient outcomes are improved. Our goal is to ensure your patients arrive at their next destination in better condition than when they left. We do our best to help patients improve, not just survive. Airlift Northwest is the crucial link between medical providers and patients, leading-edge research and real-life need, communities and high-quality care—the kind all people deserve. We’re the only air medical transport service bringing UW Medicine’s vast system of medical innovations to the field. We support our nurses with above-and-beyond training and technology. Miles from the nearest hospital, we implement the newest protocols and techniques powered by UW Medicine research. Every person has the right to the highest quality, lifesaving care. Every call is a renewal of our founding belief. Airlift Northwest is a not-for-profit community service. We provide $6 million in charity flights each year. You can help us provide care with a donation. We’re ready for anything—with the right equipment, technology and personnel for the moment, and the patient. We partner with Bloodworks Northwest and Harborview Medical Center to carry packed red blood cells and liquid plasma on every flight, so we can provide in-flight transfusions without depleting your local blood bank. This has been proven to save lives and benefit patient outcomes. We cultivate unparalleled expertise and share it for the higher good. We support our flight nurses with above-and-beyond training and technology. And we are the bridge between UW Medicine’s leading-edge innovation and those we serve. Airlift Northwest is the crucial link between medical providers and patients, leading-edge research and real-life need, communities and high-quality care—the kind all people deserve. Airlift Northwest has been accredited by the Commission on Accreditation of Medical Transport Services, or CAMTS, since 1997. 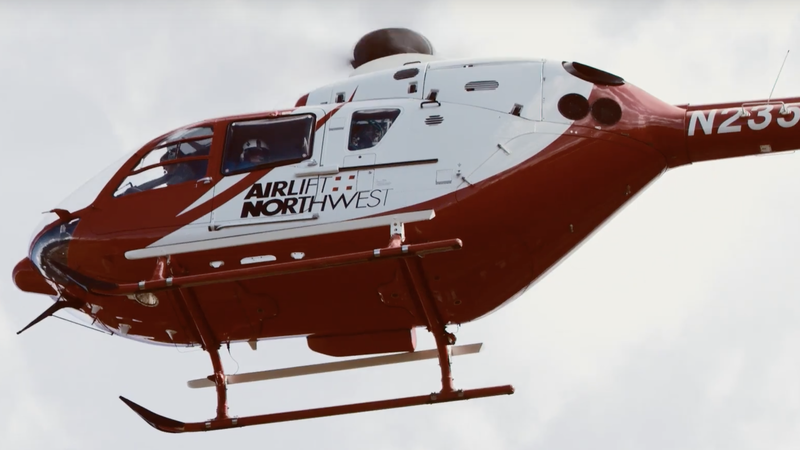 Airlift Northwest was the first air medical service in Southeast Alaska to receive this recognition. Accreditation means a medical transport service meets a series of industry standards that address issues of patient care and safety. Our knowledge is your knowledge. We’re eager to share our knowledge so we can all hit the ground running—faster, stronger, better. We became experts by listening first. So whether partnering with first responders in the critical golden hour or with hospital staff for an inter-facility transport, we listen first and share the right knowledge for the situation. We act with urgency to offer continuity of care for your patient, with a professional and quick transition. We respect your team’s expertise and understanding of the situation at hand, and we freely share our expertise with you to strengthen the chain of care. We partner with hospitals across Washington, Wyoming, Alaska, Montana and Idaho. Our UW Medicine affiliation strengthens our care, while at the same time we maintain good relationships with all hospitals in our region. We fly wherever first responders and care providers decide the patient needs to go for care. Whether you’re off on an Alaskan adventure or hiking in the Cascades, AirCare is the lifesaving medical transport membership ready to help if an illness or accident happens. Signing up is fast, inexpensive and might save your life.